This article is about the flat disc component of a galaxy. For the type of galaxy with disks, see disk galaxy. 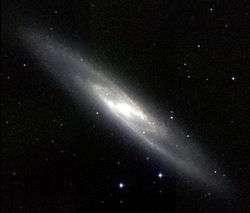 A disc is a component of disk galaxies, such as spiral galaxies, or lenticular galaxies. The galactic disc is the plane in which the spirals, bars and discs of disc galaxies exist. Galactic discs tend to have more gas and dust and younger stars than galactic bulges or galactic haloes. The galactic disc is mainly composed of gas, dust and stars. The gas and dust component of the galactic disc is called the gaseous disc. The star component of the galactic disc is called the stellar disc. It has been noted that the orbital velocity of stars in the disc of most disc galaxies is inconsistent with the amount of luminous matter calculated for the galaxy. A possible explanation for this problem is the non-luminous dark matter. Van Der Kruit, P. C.; Freeman, K. C. (2011). "Galaxy Disks". Annual Review of Astronomy and Astrophysics. 49: 301. arXiv:1101.1771 . Bibcode:2011ARA&A..49..301V. doi:10.1146/annurev-astro-083109-153241.